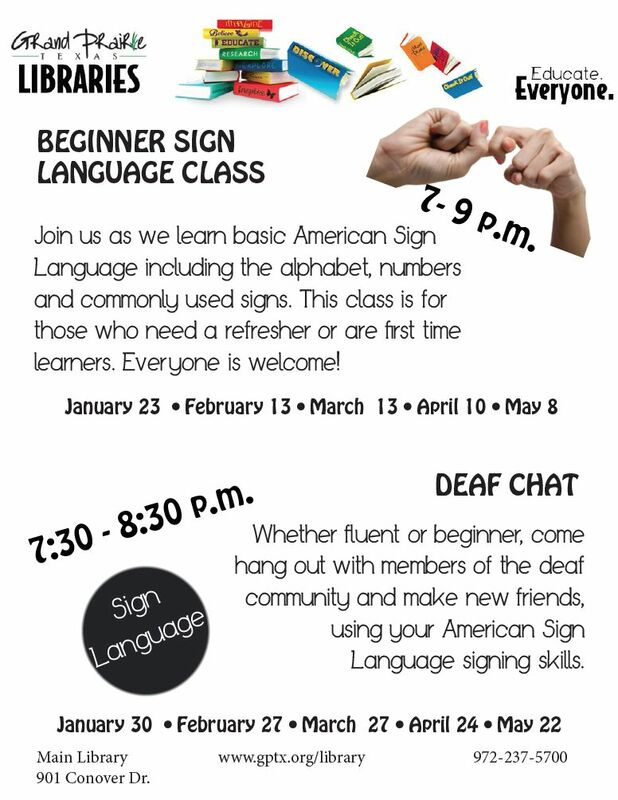 Join us as we learn basic American Sign Language, including the alphabet, numbers and commonly used signs. This class is for those who need a refresher or are first time learners. Everyone is welcome! 7 pm to 9 pm. Whether fluent or beginner, come hang out with members of the deaf community and make new friends, using your American Sign Language signing skills. In an effort to serve and educate the community, the Grand Prairie Public Library will be hosting a Deaf Chat series at the Main Library, 901 Conover Dr. Whether fluent or beginner, this is an opportunity for members of the deaf community to meet one another, immerse in the culture and practice their signing skills in a relaxed atmosphere. Deaf Chat will meet once a month at 7:30 p.m. Dates are listed below. The Grand Prairie Public Library System has established itself as an indispensable resource for the community. The rich and diverse programs offer patrons an escape from the mundane and an opportunity to learn, grow and engage with others who share their interests. Library programs serve to nurture and inspire a lifelong love of learning and to provide patrons with the chance to both challenge and interact with one another.